​ ​Just when we were about to kill each other we got a fantastic phone call from our soon-to-be “Boss”. It’s been a LONG time since I’ve had a boss. This is going to be interesting. I know I’m a great employee so that part I’m not worried about. I guess I’m worried about knowing what is needed from us so we can be sure to provide it. Our motto has always been “Underpromise and overdeliver”. I have gone from 5 bug bites to 9 as of 4:30pm. We just put Frontline on all the pets and now have the fun job of clearing out the house. Yes, it is awful but it is what I signed up for. Just found out from a professional exterminator that my bites are mosquitos. Well that’s a relief since we have 27 feet of HOUSE to live in and fumigating really is not an option. I am preparing 25 magic envelopes tonight. 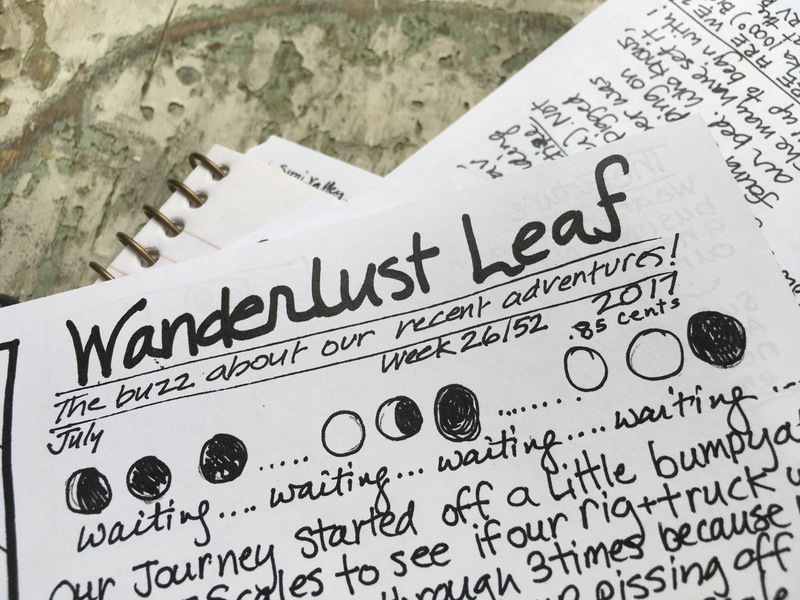 I only had enough budgeted to print 25 copies of my newest HAND DRAWN newsletter called The Wanderlust Leaf. I’ve had no internet (stable anyway) so I have spent time just doodling out a fun little daddy that I hope to continue. No excuses unless I run out of Sharpies and/or Ticonderoga pencils. Top priority (check your mailbox from the US Postal Service) are people leaving comments about my posts on my actual blog (not on Facebook) that I have a home address for. This idea was not in the family finances or budget – it costs 30-cents to print ONE piece of paper. There is no other printing place in all of Bishop, so we are stuck. I will say that Alex’s Printing on Main Street is a great place though. I got a lot of help making sure my prints were perfect. My newest creation: The Wanderlust Leaf! Randy is currently cleaning out all of our delicious plumbing because WE GOT THE GREEN LIGHT TO HEAD TO MAMMOTH!! We have a few questions still to make sure we leave at the right time but overall we are seriously excited to move a step further on our original plan. Just last night we had no confirmation and were trying to figure out how we would make this happen. Living in Bishop is NOT ideal for our pets and that is our biggest concern. It was great news to hear from our boss. So, the best way to hear about what is happening is going to be this blog. I hope you subscribe to it if you are interested. If you want to get a copy of our first Wanderlust Leaf please read my blog and leave me comments. I will read and reply to each of them when I have internet. Promise. Thank you friends and family! Previous Previous post: It’s Amanda Shoemaker’s Birthday Today! I love reading about each of your adventures. I definitely would love to get your newsletter! I miss you guys so much, but keeping in touch through letters, texts, and reading your blog, makes your absence a bit more manageable. So happy you will be able to get out of the heat and get on with what you really want to do. Love that we can all stay connected somehow even over the miles. You two will make great camp hosts, no doubt about that. Congratulations on a step towards your next adventure!! Mark and I couldn’t be more excited for you !!! This is such good news !!! It’s about time , we wish you good luck at Lake George !! I’m excited to read about your next/new adventure! I love reading your blog. You always have great stories to tell and you are a great storyteller. I miss you both, but thanks to Amanda and Leah we can still enjoy our outside exercises. I wish you the best in the next chapter of your life. GREAT NEWS! It came on a great day and maybe straight from your angel Amanda!! I’m just fascinated by this journey you have chosen to be on and love that you are sharing it. Please continue to share with us!! We truly miss you guys but we are super happy to see you living out your own dreams! Love you both! I love trying to follow your crazy adventures on FB and Instagram. I know that we didn’t get to spend much time the last several years, me being in Indiana and you being in Simmi but I always loved seeing you and Randy have so much fun. I want to hear all about your new adventure, maybe once you guys are settled in we can schedule a phone date and you can tell me all about your new place. I love you tons, give Randy a hug and lots of cuddles to your animal babies. I’d love to receive your Newsletter. Please add me! Miss you guys. So happy that things are working out and you’re now on your way to Lake George. Good luck!! I was kind of hoping you were driving cross country & visiting me! You’ve got my address, I’ll donate to the newsletter fund! I just want one! Hi – just wanted to let you know that I’ve been following along on your adventures across our planet. It’s totally great and interesting. Be safe and have a great time. Hi Sarita, thanks for the letter! It sounds like things are going well! Stay away from those bears! Not to diss Alex’s but would getting your own printer soon pay for itself? Problem is that we have so little space. We are living in a travel trailer with two dogs (one BIG lab who has a killer tail that just seems to hit EVERYTHING behind him). Our set up is small but mighty. Thanks for the idea though. Alex’s seems to be the Go-To place for everyone in the area (which would explain why it was SO busy).